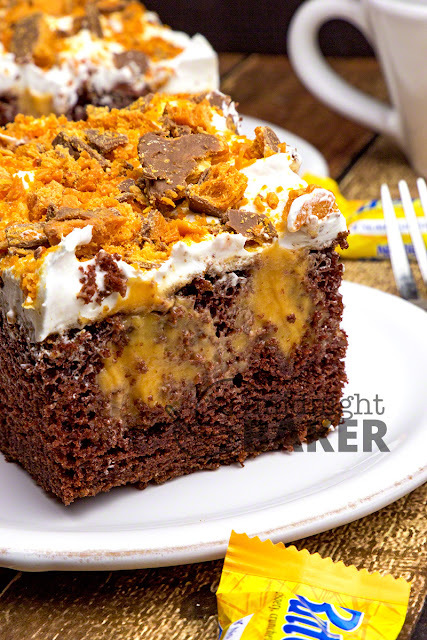 A poke cake especially for chocolate and Butterfinger lovers! Easy to make and even easier to eat! This is an easy dessert to make. First it starts out with a chocolate cake mix. Then you poke some holes in the cooled cake and pour on some butterscotch instant pudding. It’s all topped off with whipped topping and crushed Butterfinger candy bars. Most poke cake recipes call for a 13 x 9 sized cake. I do things a bit differently. What I do is make the cake in a 11 x 7-inch pan. Not only is the cake higher, but because it is higher you get more of the creamy pudding filling. One small box of instant pudding will suffice to fill the holes, but if you want to make sure they are over filled, then use two boxes. If you use two boxes, you’ll have pudding left over, but that’s no tragedy! Some recipes tell you to poke the holes in the cake about 10 minutes after removing it from the oven. I never do this because quite frankly, it’s messy. I wait until the cake has completely cooled. Make sure you use a wooden spoon with a round handle. Nothing will stick and you’ll get nicely shaped holes. This is not as easy as you may think! I don’t mean that it’s hard work, but I used a meat mallet and got bigger chunks than I wanted along with a lot of powder. Also they don’t break easily if you try to do it by hand. Trust me, I tried that first. So I just stuck with the big chunks and the powder. On a recent shopping trip, I noticed they now sell Butterfinger pieces. You can find them where the chocolate chips are. That way, you don’t have to crush the candybars. Another good thing about buying this in the baking aisle as opposed to the candy aisle is there is no tax (at least in New York) on the “baking” ingredient where we pay tax on it if it’s sold as “candy.” The same thing applies to M&Ms. Taxable products vary from state to state, so it’s best you find out what your laws are. I can only speak for New York. Preheat oven to temp directed on cake mix box. Spray or grease a 13 x 9 or 11 x 7-inch baking dish. See NOTES if using 11 x 7 pan. Make cake according to box directions. Remove from oven and let the cake cool. Using the handle of a wooden spoon, poke holes in cooled cake about 1-inch apart. Make pudding mix according to package directions for pie filling. Pour pudding over top of cake making sure the holes are filled. Refrigerate cake until pudding is set--about 2 hours. Frost cake with the tub of whipped topping and top with broken candy bars. You will need to add about 10 minutes to the baking time for the 13 x 9 that's on the box if you use the smaller pan. 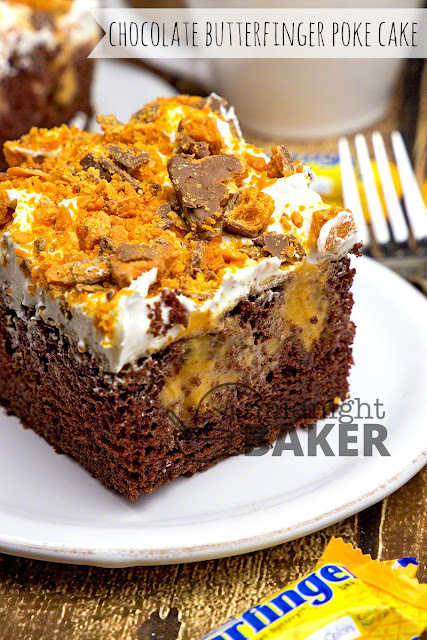 0 Response to "CHOCOLATE BUTTERFINGER POKE CAKE"